Located near Lake Chicot in Lake Village, Arkansas, which is the largest Natural Box lake in the US. Minutes from Harlows Casino in Greenville MS. This cozy 1 bedroom apartment with a fire/place also has a Sofa Sleeper for extra guests. This apartment is located within a few feet of a BBQ Restaurant and Bar for convenient dining and an evening cocktail. It also has an onsite car wash available for a quick after road trip cleanup. Family friendly Home with room for everyone! Abbie Place is a beautiful spacious Four Bedroom home with two large updated bathrooms. The entry level features a queen bedroom, large living room, dining room, family room with a sleeper sofa & wood burning fireplace, the kitchen is equipped with everything to make your trip enjoyable, stainless steel refrigerator & dishwasher, microwave, plates, silverware, pot & pans to cook, as well as coffee maker, waffle maker and many of the small appliances and implements you have at home. There are two additional queen bedrooms on the upper level along with a full -size bedroom & second floor full bath. There is a washer & dryer to use to keep things clean. The sunroom is in the back of house, we have a 2 car attached garage, large backyard great for grilling and enjoying your vacation. 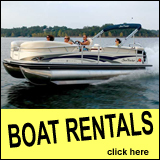 Parking for RV or any other recreational vehicle with an enclosed fenced. Kids will love to play soccer, volleyball, tennis or basketball, football, you name it in the privacy of this property. Free Wifi to check emails and to plan your stay. Direct-tv to watch your favorite shows. There are carbon dioxide detectors & smoke detectors throughout the home. We have two fire extinguishers (1) located under the sink in kitchen (2) in laundry room behind the door. We provide exterior only video camera of property for your safety. Don't settle for a hotel room, when you can stay in a lovely, family owned home with plenty of space & privacy where you can feel right at home from the moment that you arrive. 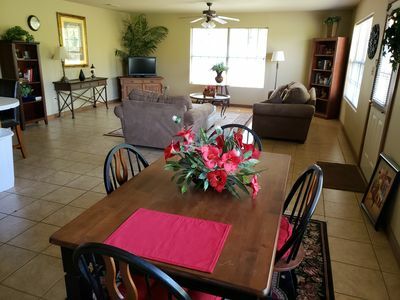 Let our home enhance your stay here in Pine Bluff & give you great memories of your vacation. 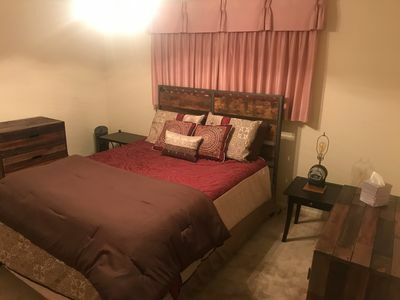 This property is centrally located in a quiet neighborhood, near Pines Mall for your shopping pleasure, movies, restaurants, bowling & ATM banking & groceries . 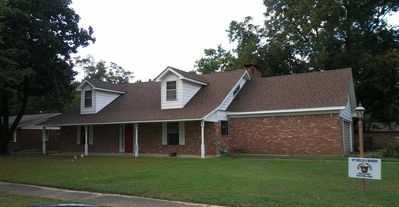 Easy access to Downtown Pine Bluff, Arts & Science Center, Pine Bluff Convention Center, Saracen Landing Water Park & walking trails, Regional Park Golfing , fishing & boating dock & restaurant, University of Arkansas at Pine Bluff & Railroad museum all within 5 miles from this property. 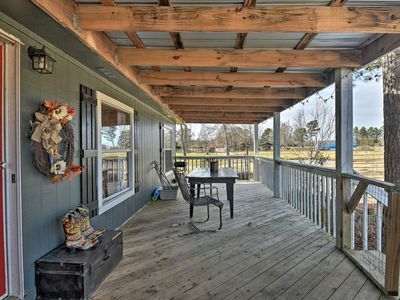 1.5 miles from Interstate 530, forty-five minutes from Little Rock Bill Clinton Presidential library and just 30 minutes from Stuggart , for great duck hunting or visiting Riceland Rice . Only 90 minutes from the beautiful bathhouses of Historic Hotsprings & Oaklawn Horse track & Casino, with scenic views of Lake Hamilton. beautiful lodge in a relaxed country setting! Overlooking the natural banks of Maddox Bay, The Sportsman is a beautiful 3,130 square foot custom built cypress cabin, built in 2011. It's just a few miles south of Holly Grove and a 45 minute drive east of Stuttgart, AR. This property is perfectly situated for access to waterfowl, geese, whitetail deer, small game public land, freshwater fishing, and nature trails. 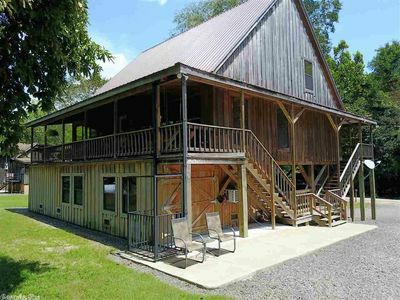 THE SPORTSMAN HAS TWO RENTAL OPTIONS: #1: Main Cabin Rental (2nd and 3rd level of cabin) - sleeps 11. Perfect for larger groups or duck clubs. 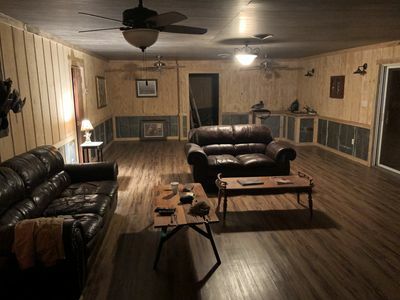 #2: Basement (Man Cave) Level Rental (ground level). Has its own entrance and a studio layout. Perfect for hunters and fishermen or smaller groups. Sleeps 4 (plenty of room for air mattresses or cots) - Please see our other listing for rates & availability. THE MAIN CABIN The 2nd and 3rd floor, or the "main cabin" as we call it, has it's own entrance on the porch level. Amenities include: *Master bedroom with a king bed & spacious bathroom located on the main floor. Two large master closets. *Great room on main floor with vaulted ceiling. Open-layout with windows that look out over Maddox Bay. *Roomy kitchen with a cook top, refrigerator/freezer, dishwasher, double oven, microwave, coffee maker, toaster, and family style seating in the dining area. *Large porch on front and back of the cabin (the rear overlooks Maddox Bay). 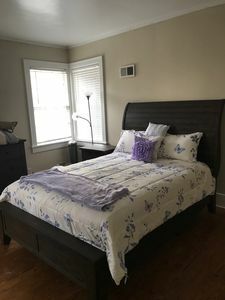 *Huge laundry room with washer/dryer and storage closet *3rd floor has 2 guest bedrooms with a shared bathroom. Bedroom #1 has two bunk beds (twin over full & twin over twin) as well as a single bed (sleeps up to 6). Bedroom #2 has a twin over twin bunk bed and a single bed (sleeps 3). Currently, all renters of The Sportsman have access to Maddox Bay using a boat dock located on an adjacent property less than 500 yards from the cabin. We are under contract to build a state-of-the-art dock that is expected to be completed and fully functional by June 2019. A few miles away in Holly Grove is J & J's One Stop, where you can buy gas, snacks and some groceries (no alcohol). Holly Grove also has a liquor store. 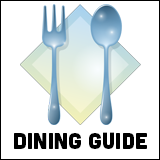 Clarendon (20 min drive) has a Dollar General and Dewitt (40 min drive) offers more dining options, as well as a Kroger shopping center. Stuttgart (45 minute drive) has a Walmart, Sam's club and higher-end shopping. Don't forget to stop by Mack's Prairie Wings while you're there. 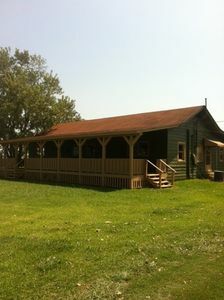 The Sportsman "Man Cave" is the ground level of The Sportsman Hunting Cabin & Retreat. It has it's own entrance and can be rented out separately from the "main cabin" which is the 2nd and 3rd level of the cabin. For larger groups, please see our other listing! The man cave has a studio layout with 2 twin/twin bunk beds and plenty of room to bring in cots and/or air mattresses. The kitchen has a stove, microwave and refrigerator, as well as a mudroom ideal for storing hunting gear and dog kennels. The kitchen has a microwave, cooking range/oven, toaster oven and refrigerator. Comfortable seating area with a large flat screen TV (and sectional couch). This space is perfect for small groups to use during hunting and fishing seasons. 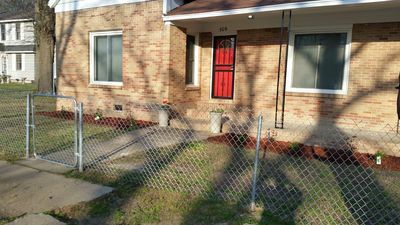 You will share 3 bedrooms, 2 baths in a privately owned occupied home. We live here, but you will enjoy as much privacy as desired. Located in the heart of Stuttgart, you are within 15 minutes of the best duck hunting in the world! The rooms include 1 master w a king bed, which can sleep 2 if you choose, and private bath w a new step-in shower. The 2nd and 3rd bedrooms share a bath with a new shower/tub combo. We allow hunting dogs w crates. I am an experienced duck guide at one of the premier duck clubs in Stuttgart so I am well accustomed to the needs of duck hunters. Plenty of parking and boats are welcome. You will have total privacy in the 3 rooms. Huge 1,200 square foot apartment featuring a second floor view of downtown Stuttgart. 12 foot ceilings with Navy Blue velvet fringed drapes. Chandeliers in each street front window, large chandelier in the bedroom, and ceiling fans with Edison bulbs in living area. Full kitchen, including dishwasher, range, and refrigerator - all new black stainless by Whirlpool. Free WiFi. 65” LED tv with DirecTv Now. Seven foot wide shower with rain head. Washer/Dryer combo by LG. Tastefully renovated 100 year old historic building. NON SMOKING. NO PETS. Max occupancy is two. MAD Just 4 Blocks Away! 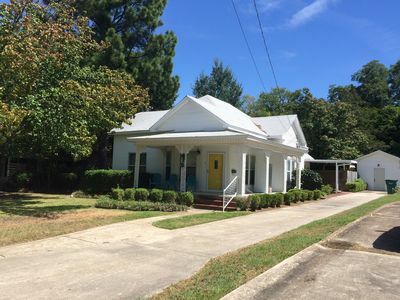 This precious cottage was built in 1934, has recently been refreshed with newly refinished hardwood floors and updates throughout the property. Close enough to the action MAD, but far enough away to enjoy the quite surrounding of a small town. The master bedroom has a Queen bed with inviting cotton sheets to sleep your cares away.. the is a on suite bathroom with waterfall shower. 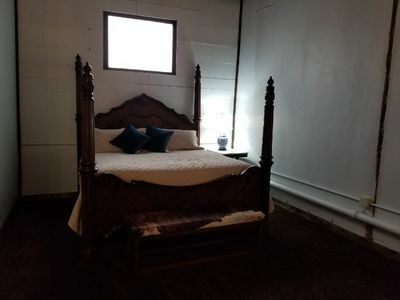 The middle bedroom has a queen pull out sofa, that can be a queen bed at night with the luxury bedding or fold back enjoy the couch option. The front bedroom has a queen bead with soft high thread count sheets to help sleep away your night. The Kitchen has all the tools you'll need to cook or carry in food for your crew. The 2nd bathroom is a shared Jack & Jill between the middle and front bedroom. The front porch is inviting place to gather before heading downtown to MAD( Murphy Arts District). It is a easy walk to downtown to enjoy the shops and restaurants that await you. This property is Realtor owned. 1967 Brady Bunch house. 3-2-2 home with extra room and bath for rent. Comes with garage parking for one car. Mmmmmmmmmmmmmmmmmmmmmmmmmmmmmmmmmmmmmmmmmmmmmmmmmmmmmmmmmmmmmmmmmmmmmmmmmmmmmmmmmmmmmmmmmmmmmmmmmmmmmmmmmmmmmmmmmmmmmmmmmmmmmmmmmmmmmmmmmmmmmmmmmmmmmmmmmmmmmmmmmmmmmmmmmmmmmmmmmmmmmmmmmmmmmmmmmmmmmmmmmmmmmmmmmmmmmmmmmmmmmmmmmmmmmmmmmmmm.......".........................."................""
Marvellous Occasion is a New Home Rental Company Located in Marvell, Arkansas. 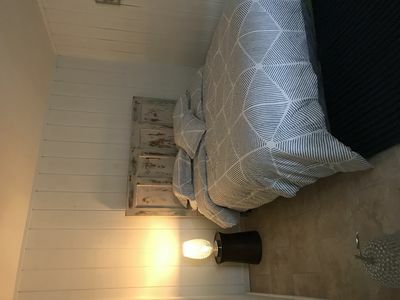 Marvellous Occasion is a New Home Rental Company that allows you to Book a stay at an actual Home instead of a crowded Hotel room, located in Marvell . Think of it as a Home away from Home. Just bring your bags, everything is already included. A fully functional kitchen, Bath, Free Wi-Fi, washer/Dryer, Iron/Board, and even Dishes. We have two different Properties. This Properties has 2 Bedrooms and 1 Full Bath. 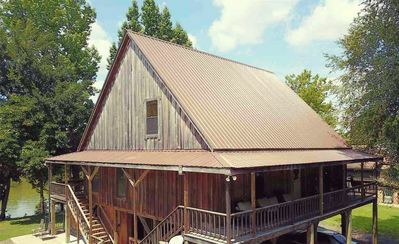 Marvellous Occasion is a New Home Rental Company that's located in Marvell, AR..
Marvellous Occasion is a New Home Rental company that allows you to Book a stay at an actual Home instead of a crowded Hotel room, located in Marvell Arkansas. Think of it as a Home away from Home. Just bring your bags,everything is already included. A full kitchen, Bath, free Wi-Fi, washer\dryer, iron\board, and even dishes. We have two different properties. One home has 3 bedrooms with 1 1/2 bath, and another Home with 2 bedrooms with 1 full bathroom. Book over the phone or on our website and make your trip a MARVELLOUS OCCASION!!! Welcome to your home away from home. 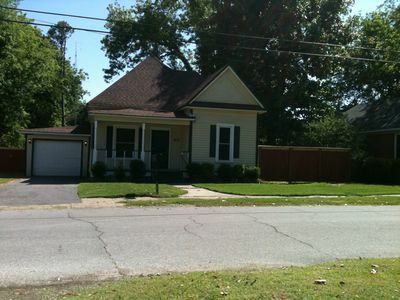 Freshly painted interior, refinished hardwood floors and spacious areas for family gatherings. The large back yard offers a great space for an outdoor social function. Eat-in kitchen, separate dining with living room and a fireplace for those cool nights. A side patio sits off of the 2nd bedroom. Great for stepping outside your room and gazing into the stars. Covered parking is available. There's also parking available for an RV. The home is not far from a Duck Hunter's Paradise.